The 64th Vimal Filmfare Awards 2019 is happening tonight (March 23) at the Jio Garden in BKC, Mumbai. Besides the interest to know who all will walk away home with the black beauty, all eyes are on the red carpet to see who has dressed the best. The celebs have walked in wearing the most glamorous outfit but it is this young diva who has grabbed our eyeballs, Sara Ali Khan. Daughter of Saif Ali Khan and Amrita Singh has never failed to impress us with her fashion statement. For this prestigious award show, Sara is looking like an ethereal diva. 64th Vimal Filmfare Awards 2019: Janhvi Kapoor Glamorous Avatar for the Star-Studded Affair Will Leave You Awe-struck! See Pic. The Kapoor sisters Janhvi and Khushi, Radhika Madan, Mouni Roy, Diana Penty, Dia Mirza, Chitrangda Singh, and many other beauties have walked in wearing gorgeous outfits for the 64th Vimal Filmfare Awards. 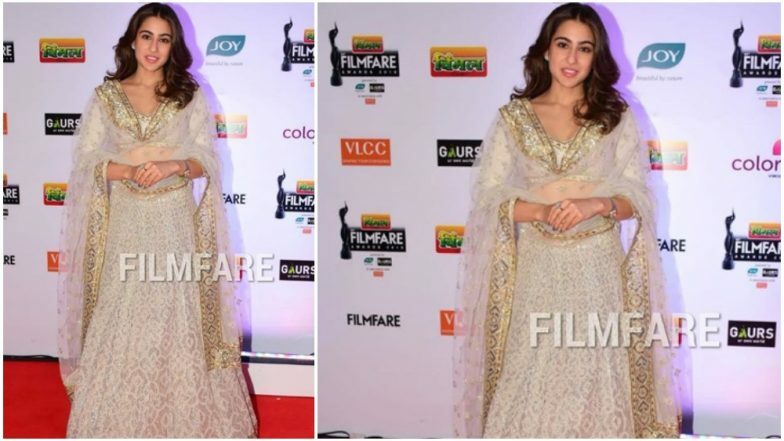 Sara Ali Khan was spotted in a beautiful ivory and gold lehenga. Those intricate detailing on her outfit, definitely made it look even beautiful. Sara kept her look simple and classy. Sara Ali Khan and Kartik Aaryan Are Made For Each Other, Declare Fans After Seeing Them in Imtiaz Ali's Next Film's Poster! Sara Ali Khan is who is all excited to be a part of the 64th Vimal Filmfare Awards said, "The Filmfare Awards is something that I've been coming to since I was a child. So when you ask about how mom and dad are feeling, mom's emotions are like finally it's worth it that you're going." She also said, "Today I'm worth a nominee. So this is why I'm here and mom is a little less like why are you. I'm excited, a little bit nervous, not a lot." The award nite is going to be loaded with some mind-blowing performances which we just can't wait to watch. We also can't wait to know who all will bag the trophies on this 64th Vimal Filmfare Award. Stay tuned for all the updates from this star-studded affair.